Life is crazy enough, but when you somehow lose the draft of your post, it gets really frustrating. However, I must have done something wrong here today, so I begin again. I love Wednesdays because I get to be part of What I Ate Wednesday, the fun-filled food fest (or food filled fun fest) hostessed by the lovely Jenn at Peas & Crayons. Let me get right to it before I lose everything again!! As the title suggests, it seems I’ve eaten a lot of cottage cheese lately. I’m Ok with that because I really Like cottage cheese. Maybe one week I’ll do an entire cottage cheese post. We’ll see. For the time being, let’s get started. 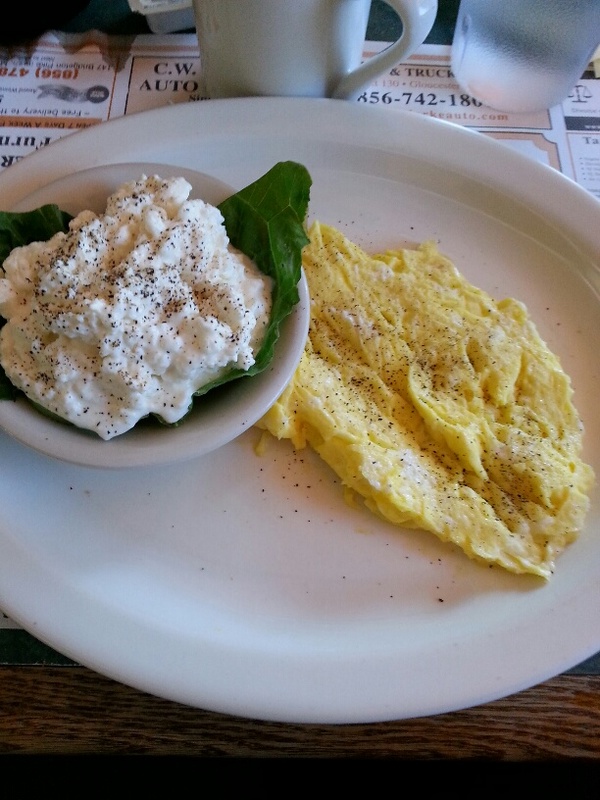 Simple breakfast at the diner…scrambled eggs and yes, cottage cheese. 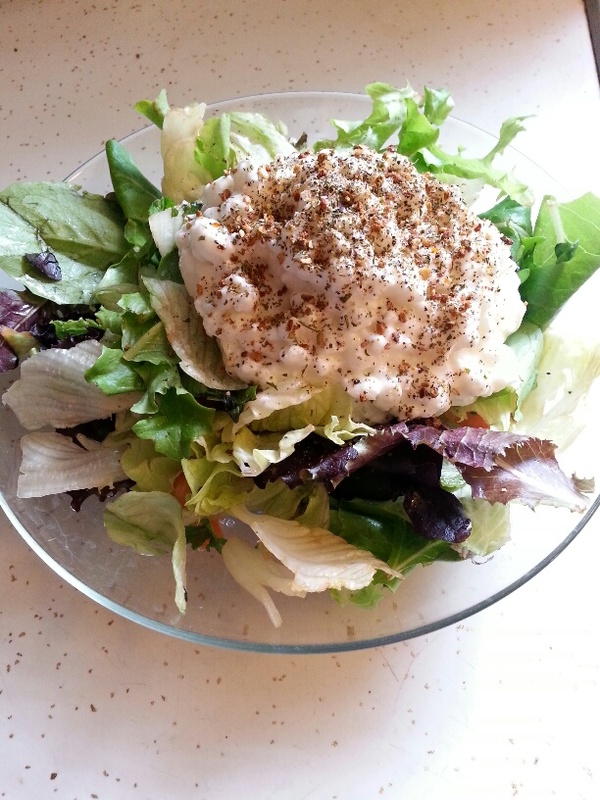 A yummy homemade salad with salad from my sister Ele and cottage cheese, of course! I don’t know why but I think this photo is really pretty. Natural light is the key, I think. Tasty too…the salad, not the light. 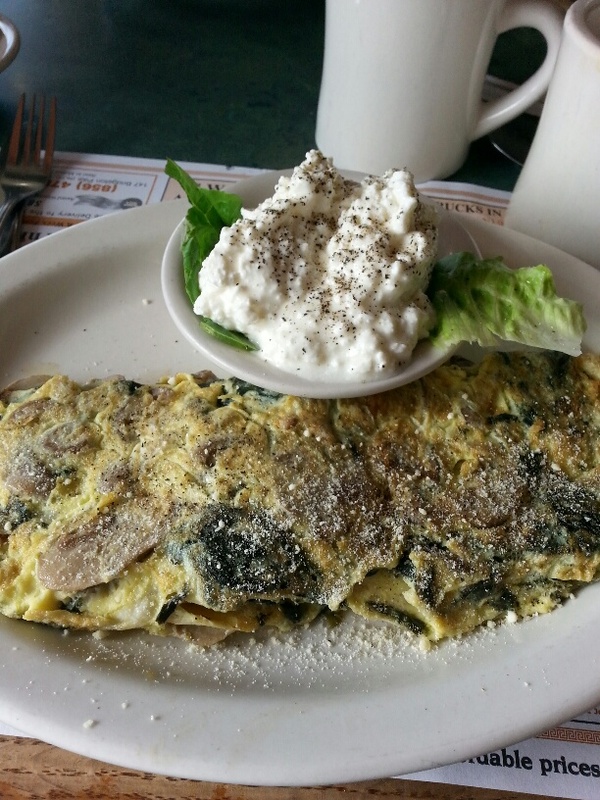 A mushroom and spinach omelette, sprinkled with parmesan cheese and a side of cottage cheese! I’m sensing a pattern here! 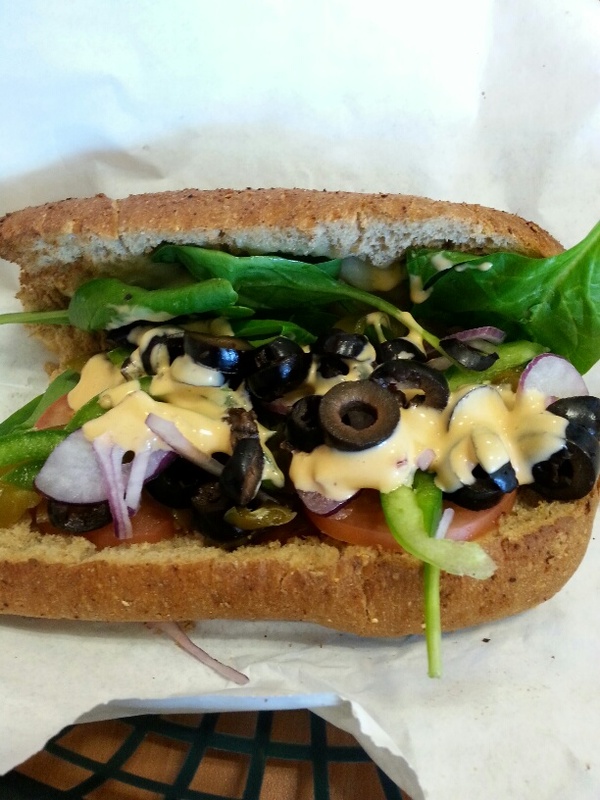 One of my favorite lunches-Subway veggie delite. On the bottom is pepper jack cheese toasted. Topped with spinach, tomatoes, onions green peppers and black olives. On top of that is the Southwest Chipotle sauce. The Best! Last but not least was yesterday’s breakfast…yes, I know when this one was. 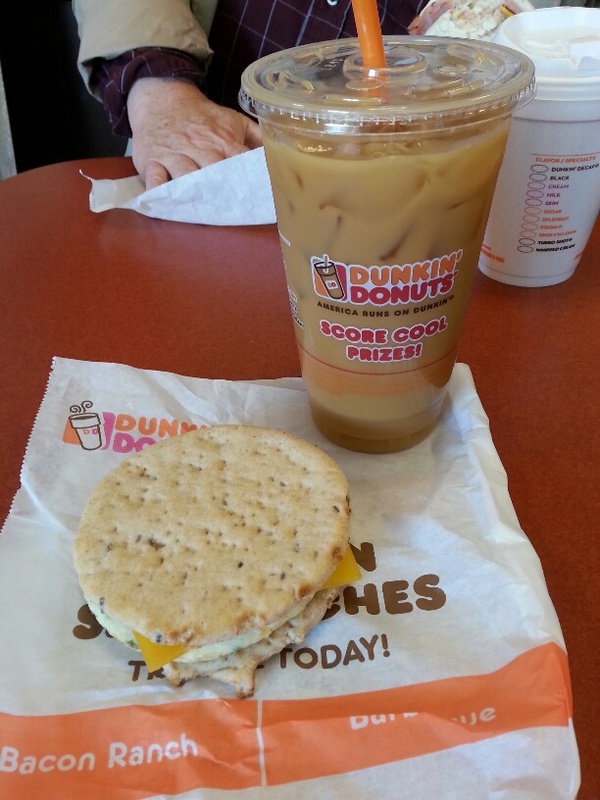 An unexpected stop at Dunkin’ Donuts for breakfast/lunch. A veggie egg white flatbread. My favorite. Accompanied by a pumpkin iced coffee. It was so good. It had been a while for both things. I try to duplicate the pumpkin coffee at home but without much success. No cottage cheese in this meal, but don’t worry, it’ll show up again next week! I’ve been working hard to stay on track with my food this week. I’m feeling much more like I’m back in control. It’s a good feeling. We’ll see what kind of results I get when I go to my Weight Watchers meeting on Saturday. It helps to keep me on the straight and narrow. That’s it for What I Ate Wednesday for me this week. Be sure to check out what everyone else is eating over at Peas & Crayons. It’s great fun…You’ll enjoy yourself! Thanks Jessie! I think I can handle that. It sounds so good! I love cottage cheese. I didn’t even do anything weird with it this week. Stay tuned! Have a great day! Hi Elise! Thanks for visiting! I switch the coffee, I just felt like iced coffee yesterday. Love the veggie flat bread. Please stop by again! Haha another cottage cheese addict 😀 Nice to know somebody else out there! Hey, Juli!! I’m right there with you, Kiddo!! Love cottage cheese. I need to show some of my more unique ways of having it. That could be an entire post! Thanks for stopping by, please visit again! Glad I could be a good influence! I love cottage cheese as you can see. Thanks for visiting, please stop by again! I’ve never tried cottage cheese! I can’t get over the way it looks!! I know that’s ridiculous. Not ridiculous… it does look odd. An acquired taste. Lots of protein though. Give it a try! Well, aren’t you just full of cheesy information. The only thing I can report is that my pants are strangely larger this week. I think some creature has been playing tricks in my closet for Hallowe’en. GRRRR! Yes, I’ve always know I was pretty cheesy,Mr. Bear. It’s part of my charm! 😉 Wow, the mysteriously growing pants…I Love it. Keep at it and stay in touch. Fran! So good to hear from you and Happy Halloween!!!!!!! My full name is Marie Mitchell Wallwork and my IG user name is BusyBuzzy. It will be so nice to keep up with you via IG. Thanks, Marie. My user name is fabstiles and BBC Fran. I’m never sure which way it comes up. I’ll find you and then we’ll be connected. Take care, Sweetie!